Congratulations to the U16 boys and U16 girls who have qualified for the EH Regional Finals to be held on 10th March. Well done to all involved and good luck! Help us secure a £25,000 grant to teach hockey in schools across South East London courtesy of the Aviva Community Fund. Please share this link with family and friends! Advance Tickets £10, on the door tickets £12. 1 free drink with ticket. Tickets available and sign up from Liz Hawkins, Emma Greenway or Sam Druce. Your chance to be transformed and walk through the curtain…. Tonight Matthew I am…. We are again pleased to announce this years Gentleman’s dinner for the benefit of both members and Friends of Bromley and Beckenham Hockey Club. The venue will be the same with the usual three-course meal plus coffee and a couple of short informal speeches. Thanks to LPGF room hire fees and meal costs are the same as last year so cost stays at £30 per head. Dress is lounge suits and ties. This year we are hoping to boost the number of attendants from the 1’s to 7’s teams by offering a discounted rate of £25 for under 25’s as at 31st December 2018. If you have enjoyed the dinner in previous years, please advertise this year’s function to other Club members and “Friends” and invite them to make up a table. Your reply as soon as possible, but please, no later than Thursday 1st November 2018. Please note cheque payable to “Friends of BromBeck”. A team of boys from Bromley and Beckenham U14s pulled off a great result to win the London Youth Games hockey competition. The team, comprising Liam Writer, Liam O'Leary, Harrison King, Joe Furzer, Barney Spear, Sacha Jennings, Fionn Sparrow, Enda Connolly, Elliot Dodds, Conal Sparrow and Ali Valder made a great start to competition winning 4-0 in dominant and stylish fashion in the first game of the day on the scorchingly hot World Cup Quarter Final Saturday. They followed that up with a 3-0 win with Ali Valder coming to the rescue on a few occasions - setting up a the last pool game against Lewisham to see who would top the group. The boys pulled off a very comfortable 1-0 win which rather flattered the opposition, although the did nearly equalise with the very last hit of the game. The semi-final was against a very good Southwark side, but once Barney had accidentally dispatched their most dangerous player at a penalty corner - the boys went to record a comfortable 2-0 win. The final pitted the boys once again against Lewisham. The scoreline does no justice to the game as the boys again dominated the match winning 1-0 with a Barney Spear penalty corner settling the game. The performance was so complete that Lewisham only managed to get into our circle once in the game and managed no shots at all. All in all a great day - and the boys played with real skill and showed great attitude and application all day. Look out for the celebration evening! Four boys from the BromBeck U14 team have been selected to attend the South of England Performance Centre for the 2018/19 cycle of the player pathway - with Brandon Goatley and Bashir Olatunji now joining Joe Cotton and Dan Hamilton. The Performance Centre is the Player Pathway step above County level and they now form part of the top 350 boys of their age group in the country. Well done lads - and enjoy the sessions! 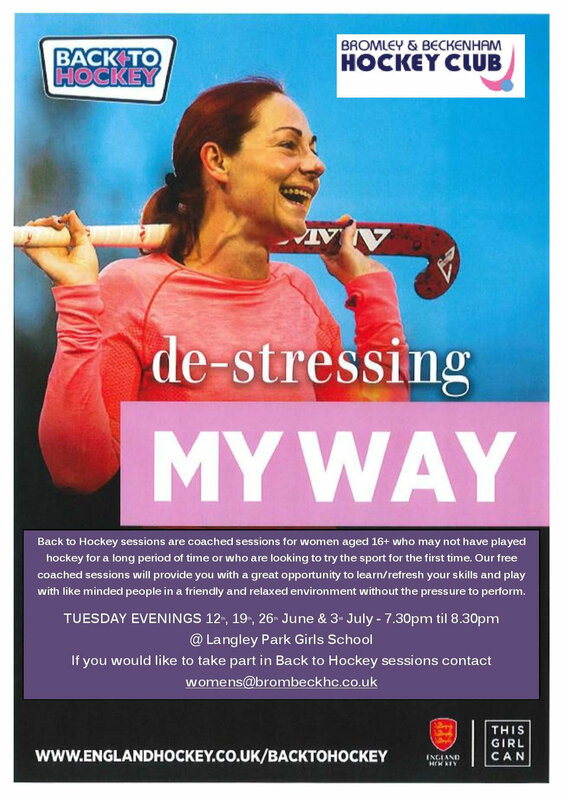 For more information or to book email camps@brombeckhc.co.ukor download booking form here. To avoid disappointment and to secure your child’s place please book as soon as possible.